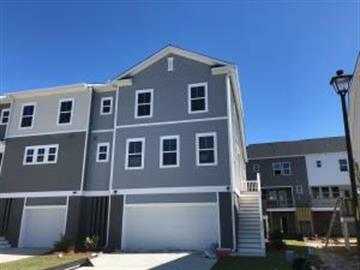 for $297,990 with 3 bedrooms and 2 full baths, 2 half baths. This 2,058 square foot townhouse was built in 2019 on a lot size of 0.08 Acre(s). This spacious three bedroom townhome boasts a beautiful designer kitchen, breakfast area, master on the main level, and a large loft upstairs. The kitchen is adorned with 42'' white glacier cabinets, a spacious island, pendant lighting, crown molding, white backsplash, and granite countertops. The main levels have hardwood flooring and trim casing at the windows. The spacious two car garage below has an enormous space for storage, and a balcony off the living room lets you relax as you soak in the sun near the marsh.